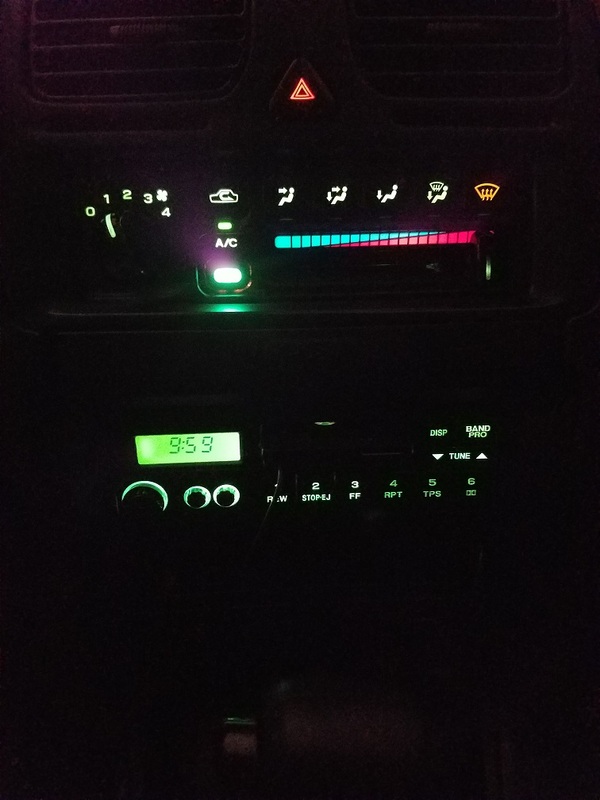 Simple one, can someone take a pic of their dash cluster and hvac controls at night with the back lighting on? I'm thinking some bulbs are out because all I've got is the gauge cluster, the red or green light for the vent selector button, the blue AC button (if it's on), and the stereo display. Thinking there's got to be a few more, like the fan speed, etc. I can tell you without the photo that the fan speed has its own bulb. I had to replace mine. It's accessible with a bit of disassembly, pretty straightforward. It's likely some gauge cluster lamps are out too. And the backlights for the pushbutton functions under that (fog lamps, rear def, cruise). I can tell you that the gauge cluster (speedo, tach, etc) bulbs are very dim, even when the adjuster is at full brightness. I opted to replace them (not all - will detail later) with LEDs - did not regret it at all! The fuel light and Airbag light stay 'constant on (illuminated)' if you put LEDs in them - no idea why - just leave the factory bulbs in those. The rest, that I can recall, have no issues with LEDs. The visibility difference is incredible and I wish I had done this sooner. These are the bulbs for the main portions of the gauge cluster. These are the bulbs for the smaller/individual items (parking brake, CEL, Oil, etc). Here is the overhead cabin light. 1 order of each and you'll be set. Of note, removing the original small bulbs was annoying - you have to pry/wedge them out (I used the point of a knife). Gauge cluster lights are working, more wondering what in the center stack should maybe have a bulb/light and doesn't. Thanks. I've not tackled that, so I can't help there. If you're still looking for it, here's my center stack.I replaced some bulbs a few years ago and I think the hardest part is making sure you don't break any plastic clips or brackets related to the hot/cold slider cable. Thank you! Yeah, got a few bulbs out . . .